If you remember a while ago, I was full of pain about my crappy you-get-what-you-pay-for radio slaves. When they worked, it was a match made in heaven. Sadly, they did not always work. Long story short. I made a change. In this two posts series, I will first detail how and why I came to select Pocketwizard as my radio system and then share my first impressions after using it for more than a month. What Matters When Selecting a Radio System? I set out to get a set of new remotes which will not fail me at critical missions. I decided on the following criteria as selection tool. Now those are very specific to my needs so you may want to give different weights or add/cross some items to/from that list. 1. Reliability – This is trivial, however worth mentioning. I mean no point in spending any money is I will still have to fight the same issues as I had with the “cheap triggers. It has to be 100% reliable. 2. Backup – It is important to me to have a backup in case something fails. This allows me to keep shooting and not lose a mission. Of course, the easiest way to back up is have duplicate an entire set, however, I am leaning towards one of the systems that uses transceivers (PW, Atlas). This way I only need 3 units to assure I have proper backup. (otherwise, I’ll need 4 units – 2 transmitters, and 2 receivers). 3. Price – I am just starting on my pro career, the blog is providing some income, yet it is not like my pockets are endless. I would need to find a good sweetspot where I am getting satisfactory results on one hand, yet not investing more that I need to on the other. I will need 1 transmitter and 2 receivers (not including backups) so unit price is definitely in the calculations. 4. Range – Currently, I mostly photograph studio and on location portraits. So I don’t feel range is very critical With current jobs (and what seems like most future jobs) anything at 50 meters and beyond will do. 5. TTL/ Advanced functions – I mostly work with manual hotshoe flashes outdoors (I side with David Hobby on the Hobby–McNally range). And just recently started using second hand kinda-old profoto monoblocks too. The only time I used TTL till now was when the Slaves did a no-pop on me and I needed some way to pop my SB800 without adding light from my on camera flash. (Only later I learned that the D300 has a master mode where you can control the flash “manually”). So TTL is really no biggie for me. I did a lot of questioning and spec diving before selecting a new slave system, however, if you are planning to buy bases on this analysis, keep in mind that most of it was internet and specs reading. Only the winning pocket wizards actually got any hands on experience. Also, I only included the models which I thought of buying. I am sure that there are at least a hundred more. Burned with my previous triggers, I only went for the mid to high end while doing my analysis. I am sure that there are reasonable to great options on a lower budget, but I wanted something with track record and a name behind it. The TTL Warship – FlexTT5/MiniTT1 Pocketwizards ($229/$199) – sadly those are not available for Nikon yet, so I did not even consider them. Yet they are here for the comparison. If I shot cannon, I would have needed 2 FlexTT5 and 1 MiniTT1 to be properly backed up (a total of $657). The Potent TTL Underdog – Radio Popper – As far as I know those were the first TTL-enabled radio slaves. 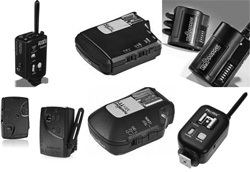 The relevant kit for me was the JrX kit that enables to control the flash power from the camera. This is a nice and useful feature. For me this is better than TTL. I would need two full JrX kits – two receivers and two transmitters ($318). The range is about 100 meters to 600 meters depending on conditions. good enough. The Never Discussed – Elinchrom Skyport SPEED – I’ve seen it in action and loved it. It is small and sweet. The price tag is nice too – $242.95 for a 2Rx/1Tx set (I would need an extra Tx unit to be covered – a total of $335.45). They have 60m range indoors. Those are the only type that has an external tiltable antenna, it feels stronger than it looks, so I am not concerned there. The very good look-alike – Phottix Atlas – not much to say it is an extremely well build (or so the rumors say) dup of the PocketWizard it can host a flash on the camera unit. And three sell for $356.14. Nice. Sadly those were not available when I made my choice. Since they are compatible with PWs, but two thirds cheaper, they would have been my first choice. Lastly, my choice – The Classic – Pocket Wizard II Transceiver – Those were definitely not the cheapest option. But, they have a very solid track record for being 100 reliable. The system is “transceiver based” so each unit can functions as either transmitter or reviver – that means I needed three units which will set me back 507 big ones. As you probably know by now,0I went with the PWs. There were not the cheapest option. (and definitely not the cheapest if you buy 3, which I needed). I may have selected the JrXs. It was a hard race between the price/features on the Jrx side Vs. years of solidness on the PW side. Solid won. It was not easy for me to depart with half a grand, but the more I shoot, the more I understand that eventually you buy the good stuff. So if you can afford it you may as well get it first, and forgo the middle range step. In the next post, I’ll share my impressions on the units (which are not surprisingly quite good). If you have any experience with those triggers, sound off on the comments.